Los Angeles is known as the city where the stars live, but Las Vegas is known for being where the stars go to party. 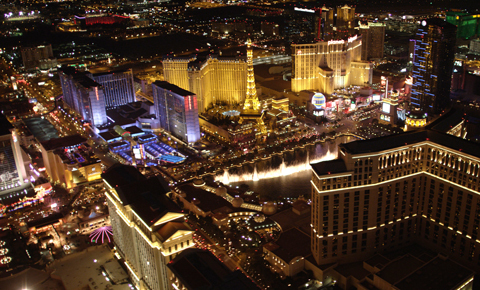 Visit both cities on this Las Vegas and Los Angeles vacation package! Start your vacation on The Las Vegas Strip in one of the famous casinos like the Bellagio, Treasure Island or the Excalibur. Escape the city for a day with a trip to the Grand Canyon. Next, fly to Los Angeles and spend a day seeing the sights of Hollywood, visiting Santa Monica Beach, and even spotting celebrities as you pass by their homes in luxurious Beverly Hills. Find Your Happy Place in Laid-Back L.A.
Next, we’ll fly to Los Angeles, the entertainment capital of the world in sunny Southern California. 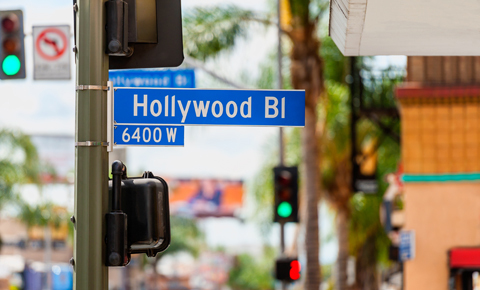 We’ll spend our first day seeing the sights of Hollywood, from Grauman’s Chinese Theater and the Hollywood Walk of Fame to the Sunset Strip and the international shopping mecca of Rodeo Drive. You may even spotting celebrities as you pass by their homes in luxurious Beverly Hills. We’ll also stop off at Santa Monica Beach and/or Venice Beach, two of the most popular destinations on the Pacific Coast. Spend your second day in LA at the movie-soaked California amusement parks. You can choose to visit Disneyland, where the classic and current movies of the Walt Disney Company come to life in live shows, colorful themed areas, and thrilling rides for kids of all ages. Or spend your time at Universal Studios, where you can “ride the movies” on thrilling roller coasters based on a variety of characters and blockbuster hits. Either park provides you with unforgettable fun! This view high above the fountains, landmarks, and resorts of the Las Vegas Strip provides a tempting taste of the many pleasures in this world-famous destination. You’ll have an entire day to spend exploring all the flashy attractions Las Vegas has to offer. Gamble at a casino, take in a show, or ride a roller coaster in this exciting desert playground. While Las Vegas is best known for non-stop action, intense partying, and high-stakes gambling, it also has its quiet side. Enjoy a peaceful view of the downtown fountains from a street level overlook. Or, spend some relaxing time at an upscale spa, shopping in boutiques, or simply people-watching at the attractions and resorts on The Strip. This view of Horseshoe Bend is one of the many stunning sites you’ll see on our guided tour of the Grand Canyon and the Colorado River. 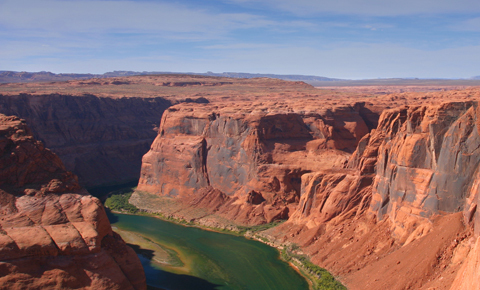 We’ll fly from Las Vegas to Arizona for a birds-eye view of the canyon. Then we’ll land to explore the canyon’s West Rim. The natural wonders of the American West are unmatched anywhere. For movie fans of all ages, Los Angeles and “La La Land” means Hollywood, the center of the world’s entertainment industry for decades. We’ll hit all the highlights: Sunset Strip, the stars’ homes in Beverly Hills, the Rodeo Drive shopping district, downtown LA, the Farmer’s Market, and more. But beyond the films, Los Angeles is also a melting pot of cultures and creative talents that form a unique destination. 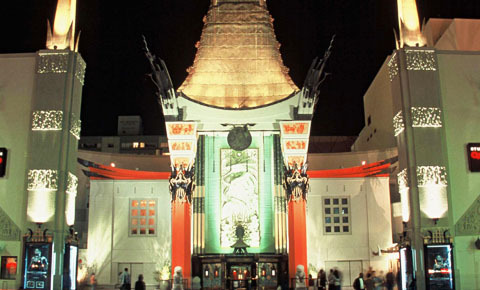 Grauman’s Chinese Theater remains one of the best preserved symbols of the classic days of motion pictures. While its unusual architecture makes it an iconic site, the movie palace is best known for concrete blocks containing the handprints, footprints, and signatures of Hollywood legends from the 1920s to the 21st Century. The theater is also located on the historic Hollywood Walk of Fame, an 18-block stretch of monuments to more than 2,600 celebrities. 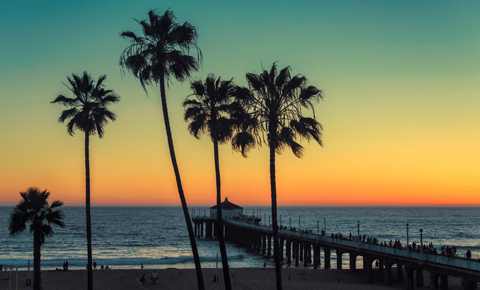 Venice and Santa Monica beaches in Southern California, two of the most visited seashores in the world, are another highlight of our LA tour. The Golden State’s Pacific Coast provides more than 800 miles of seaside beauty, providing everything from rugged rocky cliffs in the north to smooth sandy surfaces, ideal for sunbathing, in the south. You won’t forget the beaches of greater Los Angeles! Our customizable Las Vegas and Los Angeles vacation packages include 5 night accommodations and multiple guided group tours through Las Vegas and Los Angeles. We’ll tour the exciting Las Vegas Strip before taking a full day to tour the majestic Grand Canyon. Then we’ll head to Southern California for a tour of the major Los Angeles sites. Spend the next day at Disneyland or Universal Studios, the perfect cap to your memorable vacation. Arriving at Las Vegas McCarran International Airport. 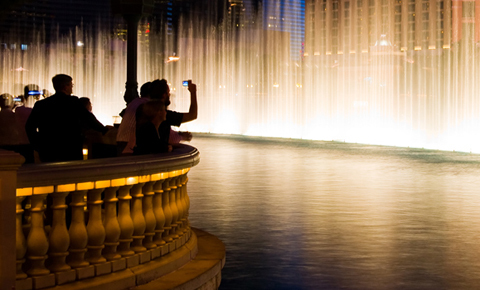 Airport meet & greet and 1.5 hour private Las Vegas Strip tour. Drop off at hotel and check in on own. Free morning and afternoon in Las Vegas. Transfer on own to the airport. Evening flight to Los Angeles. Tour features: LA Downtown, Hollywood, Sunset Strip, Beverly Hills, Rodeo Drive, Farmer’s Market and Venice Beach. Self-guided Universal Studios or Disneyland tour with round trip group transfers. Complimentary transfer to the airport provided by the hotel. Meet and greet service at the airport and 2 hour Las Vegas Strip tour prior to check in. Meet and Greet service at the Los Angeles airport. Private transfer to the hotel. Full day Los Angeles Private City Tour. Self-guided Universal Studios or Disneyland tour with round trip group transfers. *Hotel pick-up/drop-off included.